Should only a single voltage be listed on the unit, the compatible range *probably* extends somewhat above and below this value but there is no way to be sure and it is probably not a good idea to push your luck too much on the high side at least. Laser Drive generally spec's it to be +/-10 percent. All models start with 05-LPM for the brick or 05-LPL for those where a "lab-style" unit is currently available (as of 2007, indicated with a "*"). These have a brick mounted in a plastic box with power switch, light, and fuse. Where part of a complete system, the 05 may be replaced with 25. Higher voltage models are almost all 115/230 VAC compatible. But some of the lower voltage units run on 115 AC only. (They saved the cost of a wire.) If only a single voltage was listed, then what's shown is that voltage +/-10%. 1,150 to 1,700 V: 378. 1,550 to 2,350 V: 310, 346. 1,575 to 1,925 V: 390. Aerotech (115/230 VAC type). Red (or possibly other color except green or green/yellow) wire loop enables CDRH delay (cut to disable). The AC input wire color may depend on model. Green or green with a yellow stripe is earth ground and connected to cathode lead internally. (Some typical specs: LSS 05 - 1,400 V +/-200 V, 4.0 mA; LSS 2 - 1,900 V +/-250 V, 5.0 mA; LSS 5 - 2,500 V +/-300 V, 6.0 mA, LSS 10L - 3,000 V +/-300 V, 6.5 mA. Current may actually be slightly different depending on option but will probably be marked if not equal to what's shown above. There is no current adjust pot accessible from the outside. I know exactly where the pot is (by examining a unit that was partially destroyed) but that doesn't help since the rock-hard Epoxy potting compound surrounds it and drilling a hole at that location would be useless. (However, it might be possible to drill into the pot, discombobulating it, but providing access to its connections. This is left as an exercise for the student.) Note that the designation 05, 2, or 5 means that the supply is sort of intended for 0.5 mW, 2 mW, 5 mW, or 10 mW HeNe lasers, respectively. But of course this isn't etched on stone tablets! The same color code is used for rectangular bricks and integral cylindrical power supplies. +Aux output (measured +11 VDC): White or gray with red stripe. -Aux output (measured -14 VDC): White or white with black stripe. The AUX voltages are unregulated and intended to power other circuitry, possibly an RS232 driver used by the scanner. Even though DC-input bricks run at lower voltages and typically won't have the same amount of explosive energy available, a properly sized fuse is also important, if for no other reason than to protect the DC power supply feeding it! If there is no internal fuse, the typical failure will put a nearly dead short across the input if the chopper transistor fails. The label will often list the maximum current, so a fuse rated at somewhat above that will be suitable. If the supply is being used with a laser tube of much lower power than what is possible with the power supply, a smaller fuse may suffice. ALWAYS use a properly sized fuse in line with your power supply! Everyone knows this, right? But did you know that there are some commercial HeNe laser power supplies that can actually EXPLODE if there just happens to be an internal problem in the supply or the laser head when powered up if a fuse is not used in-line with the input, or if there is a fuse but it is grossly oversized in it's amperage rating, or maybe even if it is of the correct amperage but a "slow blow" type instead of a "fast blow"? I have heard of these certain power supplies actually exploding within 1 to 2 seconds after being powered up, well today, it happened to ME while testing a lot of power supplies for 2 to 3 mW HeNe laser heads! No names will be mentioned, but the manufacturer's initials are L.D. The power supply that did explode on me was fused, but someone, (no not me) put in a 20 amp fuse instead of a 1.5 - 2 amp. Well this was a used surplus unit pulled from medical equipment, of which I was testing out several. The first 5 worked just fine, but the 6th one had other ideas. Little did I know when I first applied the required 115 VAC that this was a bad power supply, but that's why I was testing them. The catastrophic failure occurred because to large a fuse was used but I guarantee that the results would have been NO different with this particular power supply if no fuse was used. What actually happened was that because of a malfunction in the power supply (probably a shorted rectifier in the AC line input), a 3/4" x 1/2" electrolytic capacitor exploded inside the case thus turning this power supply into a hard Epoxy and plastic BOMB. 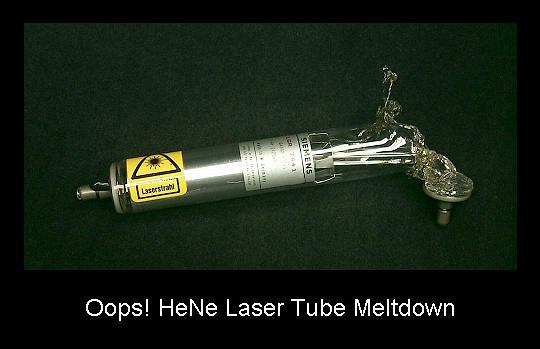 I do not believe that all commercially produced HeNe laser power supplies can react this way if powered up with an internal problem. But trust me on this one: Be sure to use a fuse and of the correct rating and type because you don't want to find out the hard way. Here are several simple regulated power supplies which may be constructed easily using parts available from Radio Shack, or possibly from your junk box. (1) and (2) are basically the same but cover the 9 to 12 V and 20 to 28 V ranges, respectively. (3) is for the higher voltage input but may be built using a 12 V transformer. However, if you have a suitable transformer, (2) is preferred to (3). These can easily be modified for your specific requirements (like 18 VDC). T1 can be an AC wall adapter with an adequate current rating but realize that their output voltage can vary by a ratio of 2:1 depending on load (they use mediocre transformers!). A low voltage power transformer will generally have a much stiffer output characteristic - less change in output voltage versus load current. It is always s good idea to have a fuse on the output, especially where the supply is capable of much higher current than required for the brick. Where T1 is an normal power transformer, a fuse should also be included in its primary. If T1 is part of a wall adapter, this isn't required as it is already protected internally. The following assume a power requirement of 10 W max. Depending on the actual ratings of your brick, component values may need to be changed. Output 9 to 12 VDC: This one uses a 12 V, 1 A power transformer with a bridge rectifier, filter, and IC regulator. The diodes can be 1N4001s or better, or a bridge rated at least 50 V and 1 A. Where the ripple (the AC component of the tube current) is found to be excessive - more than 3 or 4 percent - an external ripple reducer can be added between the HeNe laser power supply and tube ballast resistor. See the sections starting with: Current Regulators, and specifically the section: Reducing the Ripple and Noise in a HeNe Laser Power Supply.